Best laid plans as the saying goes - we left Mogan having fuelled up and anchored outside the marina for a couple of hours for a bite to eat. The forecast from passageweather was for NE F4-5 early evening going down to 3-4 in the night. The wind acceleration zones (WAZs as they are called) where the wind at the bottom of each island increases in speed to meet up with the flow down the other side of the island is always a couple of forces higher so we put our deep 2nd reef in the main just in case. The plan was to motor northwards for an hour or so in the wind dead zone to get some northing prior to sailing across from Gran Canaria round the bottom of Tenerife and up into either Los Christianos or Colon leaving us nicely placed for the 30 mile sail across to La Gomera the next day. The pilots suggest a night passage as the land breezes reduce the WAZ effect considerably. 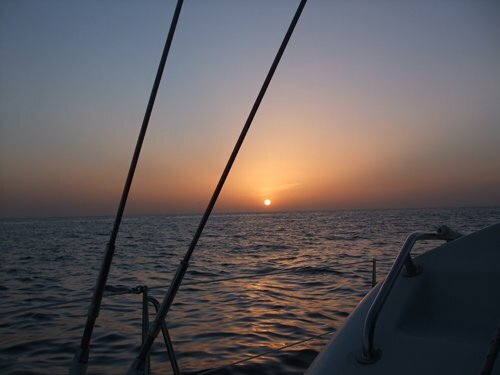 Part one went well enough - we motored north along the western coast of Gran Canary slowly meeting the south going swell which indicated that the wind was soon to come. Then the wind arrived. Lots of it in fact. We soon had 25 knots on the beam then 30 knots, which meant we had to take the considerable seas on the beam or just aft to reduce pounding. Once we could sail through these conditions it should improve and we could head up towards the south-western Tenerife coast. The wind had other ideas. As we were now equally between the two islands it was obvious that what we were getting we were stuck with for a while yet. The maximum wind alarm I had set before leaving Lanzarote sounded its warning (it was set at 40 knots true! - never thought I would hear it in anger). Tenerife began to look like a futile gesture. In fact at that point so did La Gomera leaving only El Hierro, the last island in southern Europe - next stop the Caribbean? It was a good job we had fuelled and watered up at Mogan but we hadn't actually intended to start the crossing yet - we wanted to see La Gomera. It was turning out to be a bit of a wild night. The large blue plastic funnel which I had wedged in the dinghy (used to tame the towed 12v water driven generator) whizzed out to never been seen again. The Ampair wind turbine sounded like a light aircraft was landing on the aft deck as it constantly changed direction as the boat rolled to the beam seas - adding to the general noise. Fortunately, as we sailed westwards the wind started to bend round the south end of Tenerife so we could start to head up in the direction of La Gomera. If the same was true of Tenerife as it had been for Gran Canary there would be a nice dead zone area where there was little wind, at which point we could motor direct to our destination. No dead zone this particular night. Well not strictly correct - we had a few minutes in a rotten sloppy washing machine sea. Very uncomfortable. Then the wind started to head us - first at 10-12 knots, up a gear to 20+ knots which is where the wind instrument threw a fit and packed up for the night. We wished we could have done the same. Still the wind increased and we were now having to motor straight into it. If we were still to make La Gomera it would be 18 miles before making it into the marina at San Sebastion. Surely we wouldn't have to motor hard to wind all the way. Yes - all the way up to the harbour entrance, where the sea state was reduced and we entered in comfort to take a berth in the marina. Pheew! - that was a tough one Grommet. We thought our Atlantic adventure had already started. So we are now safely in La Gomera where we intend to hire a car to see this dramatic island which is somewhat off the tourist beaten track.